Founded: in London, 1982, by Wayne and Geraldine Hemingway (both born 1961); incorporated in 1983. Company History: Specialized in customized second-hand clothing and Doc Marten shoes and boots; produced Space Baby collection, 1989; approached by Marks & Spencer to consult on shoes, 1993; introduced Dead Basic collection, 1994; opened store in Tokyo, 1994; participated in Cool Britannia, 1998; debuted website. Company Address: 17-19 Popin Commercial Centre, South Way, Wembley, Middlesex HA9 OHB, England. Company Website: www.redordead.co.uk . Kingswell, Tamsin, Red or Dead: The Good, the Bad, and the Ugly, London, 1998. Collier, Andrew, "Red or Dead Becomes London Cult Happening," in DNR, 7 November 1988. Red or Dead, spring 1998 collection. ——, "Two UK Retailers Refuse to Sell Acid House Clothing," in Footwear News, 5 December 1988. ——, "Red or Dead: This British Chain is Red Hot," in DNR, 6March 1989. Haggard, Claire, "Alive and Kicking," in Sportswear International (New York), July 1990. "Going to Greater Lenghts—Those Unpredictable British Designers Take the Lead in Feminine, Wearable Fashions," in Chicago Tribune, 31 October 1990. Heath, Ashley, "Sole Survivors," in The Face (London), March 1992. Tredre, Roger, "What's Red, Dead, Alive and Kicking?" in the Independent (London), 15 March 1992. Warren, Rachael, "My First Break," in the Evening Standard (London), 25 March 1992. "Fashion, Fascism and Dead Old Doc," in Management Today (London), April 1992. Fallon, James, "Red or Dead Finds 'Easy Does It' Works," in Footwear News, 17 August 1992. "The Doctor is In," in DNR, 28 May 1993. Stretton, Lynda, "Red or Dead," [profile] at the Fashion Page website, available online at www.fashionz.co.uk , 1995. ——, "Interview with Wayne Hemingway," at the Fashion Page website, online at www.fashionz.co.uk , 1995. "Shopping Europe," in Footwear News, 30 September 1996. Freedman, Cheryl, "King of the Catwalk," in Estates Gazette (Man-chester, England), 22 March 1997. Brooks, Libby, "Let's Help British Design Cut It (British Fashion Designer Wayne Hemingway)," in The Guardian, 4 February 1998. Red or Dead is a London-based design company producing innovative clothing and footwear at affordable prices. Consisting of a dynamic group of young talent, the Red or Dead team has worked closely to create fashion with a refreshing sense of humour and individuality. In the space of 10 years, Red or Dead grew into an internationally known design label with shops in England, Copenhagen, Amsterdam, and Hong Kong. There is an extensive wholesale network selling to shops worldwide and a thriving mail order service with a biannual catalogue. There are those who have described Wayne Hemingway as the shrewdest man in fashion. In the 1980s, while other British footwear companies were closing or retreating into safely classic styling, Hemingway, with his keen market trader's sense of street fashion, launched Red or Dead (the name came from Hemingway's father, Billy Two Rivers, a Mohawk Indian chief, and former heavyweight champion). In the mid-1980s, formative years for Red or Dead, the well tailored young executive look dominated the London High Street stores. This was power dressing, clothes to make money, the yuppie uniform. In contrast to the serious adult dressing there was a "hard times" student style, sometimes dubbed "recession chic." The poverty stricken but style-conscious dressed in jumble sale bargains and 1940s or 1950s cheap secondhand clothes. Heavy fabrics combined with a long layered look evoked the workwear of a proletariat still engaged in a class war. This was a street fashion which seemed to be suggesting some hidden socialist agenda within a mode of dress. Suddenly, politics and fashion could be mixed. The first designer t-shirt by Katherine Hammett proclaimed "58% Don't Want Pershing,"and a fashion label was named Workers for Freedom. Yuppies really were conservative and socialists were chic. The footwear of choice for the young, idealistic, and working class at heart was the classic steel-toe boot originally aimed at postmen and construction workers. The Doc Marten (DM) boot was designed for those who wanted to make an antifashion statement, and it quickly became popular with punk rock devotees. Hemingway introduced the basic DM through his Camden Market stalls and shop. They were immediately taken up by young men and women and customized by cutting in metal toe-caps, putting safety pins through them, sewing on beads and threading them with brightly colored laces. The basic black DM was sprayed in a multitude of colors and could be made as individual as the owner. 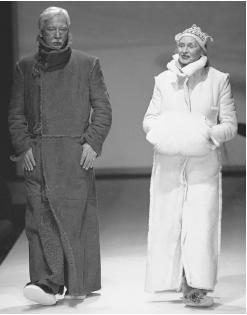 Red or Dead: autumn/winter 1998-99 collection: sheepskin coats. weighty. This went against all the traditional ideas of dainty feminine footwear for ladies who wanted their feet to look smaller, not bigger. The idea of a heavy, functional shoe for women was not initially a fashion statement; it came out of the whole recession chic concept, but it soon became an obligatory accessory for those who would never have bought secondhand. Red or Dead produced styles with jagged soles, platform soles, bigger and heavier than the basic DM. They made boots in perspex, bright orange patent, silver, and other colors. Hemingway had found a winning formula and could have continued selling chunky shoes from his now rapidly expanding retail empire. He was, however—his own words—easily bored. Moving into clothing was an obvious progression. The Red or Dead clothing collections were as antifashion establishment as the footwear. Not for Hemingway the traditional middle-class, middle-aged values of made-to-last quality—the idea behind Red or Dead was, he states, "to wear the stuff for a few months, and then it either drops to bits or becomes unfashionable." Hemingway recognized that fashion changed very quickly for young people and didn't believe in taking it terribly seriously. His collections have become somewhat more tailored since the Space Baby or Kaleido-scope days and more professional than the notorious Animals collection, where the prints simply dropped off the garments. And since Hemingway long refused to court what he saw as the "la-di-da" fashion editors and stylists, his catwalk collections were not reviewed in the mainstream fashion bibles. Yet what the fashion editors thought of Red or Dead was irrelevant; more than a third of the company's international business came from clothing, and Hemmingway's reputation as a shrewd businessman earned him an invitation to sit on the British Fashion Council. For many this was the height of irony; but Hemingway and Red or Dead had—like it or not—joined the fashion parade. By the middle of the 1990s Red or Dead had stores around the world, from several in the UK to Tokyo, Tel Aviv, Copenhagen, and Ontario. Its uncanny ability to straddle fashion and antifashion continued to make it a sought-after commodity, in both apparel and shoes. Such was confirmed once again when Red or Dead made the "Hot List" put together by Footwear News (30 September 1996) naming shoe designers "who had buyers buzzing in Paris, Milan and Dusseldorf." Hemingway's legacy to the fashion world will be twofold: first, in footwear, because Red or Dead changed the silhouette of women's feet, along with our preconceptions of how they should look; and second, in apparel for transcending and creating trends simultaneously. Hemingway's own mission statement said, "At Red or Dead our mission is to produce challenging clothing at an affordable price on a nonelitist level. We want fashion and high fashion for everybody." Whether making a statement through chunky-soled shoes or in "nonelitist" clothes, Red or Dead is and will remain, according to the Fashion Page website, "one of London's most innovative labels."